Melania Trump celebrated the record number of women in Congress at an International Women’s Day celebration even though it was Democrats who propelled the House of Representatives to that record. 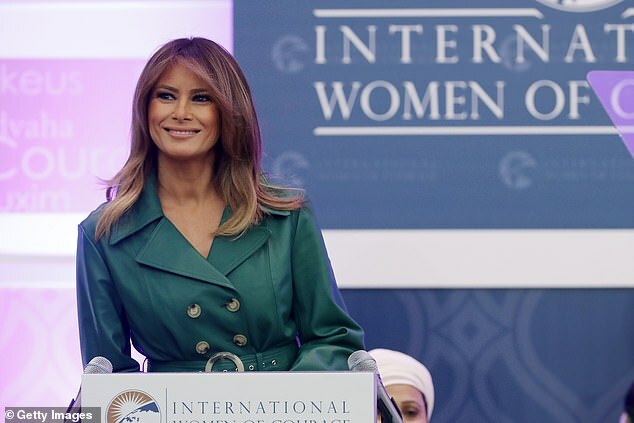 ‘We now have more women in Congress than any other time in our nation’s history,’ the first lady told the audience at the State Department during the 2019 Annual International Women of Courage (IWOC) Awards. There are 127 in the House of Representatives this year – a new record – thanks to the 35 new Democratic freshman that came in after the 2018 election. Only one new Republican female joined the House this year. 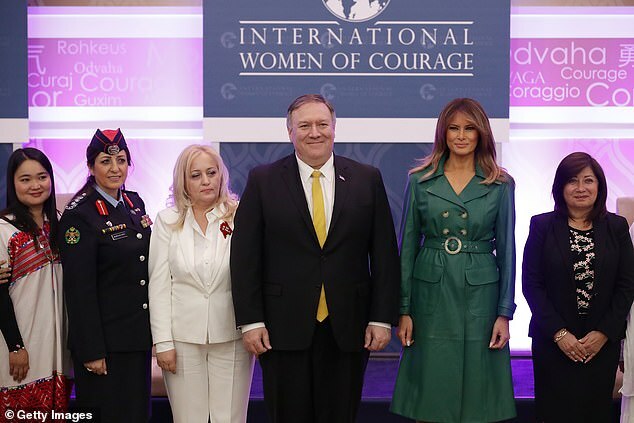 Melania Trump joined Secretary of State Mike Pompeo on Thursday for the awards ceremony that honored 10 women from around the world for their humanitarian work. The women come from from Bangladesh, Djibouti, Egypt, Ireland, Jordan, Montenegro, Myanmar, Peru, Sri Lanka and Tanzania. Melania Trump saluted their courage. ‘The women we are honoring today are symbols are courage,’ the first lady said at the event, which takes place the day before International Women’s Day. Melania Trump, in a green dress designed by British personality Alexa Chung, personally handed out the awards to the women, offering handshakes and posing for photos. 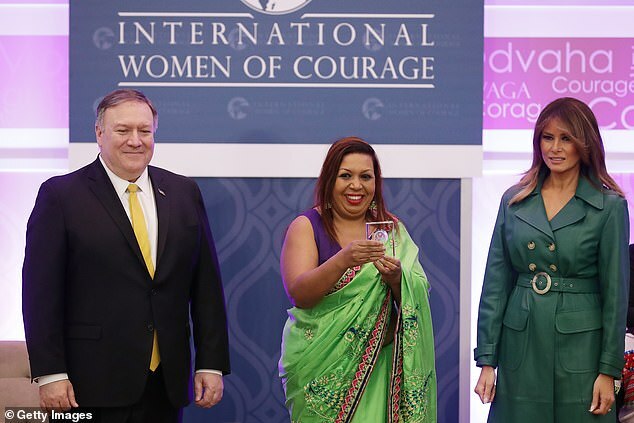 The State Department has honored more than 120 women from around the world since it created the International Women of Courage Award in 2007. She later joined the president in welcoming Czech Prime Minister Andrej Babiš and his wife to the White House. ‘You did a great job this morning,’ President Trump told her of her State Department event. 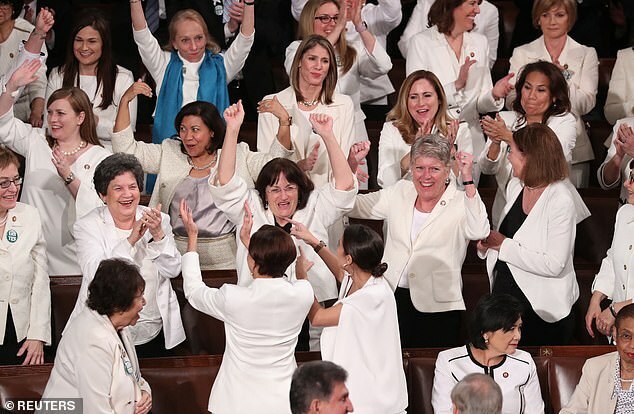 The Democratic women in the House, who have made waves in the three months since they took office, wore white and gave President Donald Trump an unexpected standing ovation during his annual State of the Union address last month. They clapped joyously as Trump spoke about the economic gains that have been enjoyed in the United States by women since he took office. 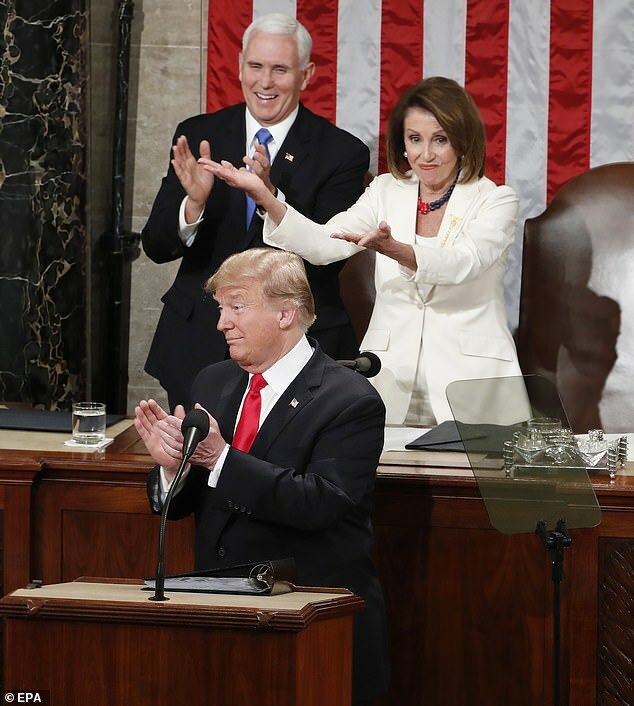 ‘No one has benefited more from our thriving economy than women who have filled 58 percent of the newly created jobs last year,’ Trump said, prompting loud cheering from the section of women. As they started to take their seats, the president suggested they stay standing, because he had another line they’d like tee’d up. The second applause line garnered an enthusiastic response from the women who chanted ‘U.S.A’ with their colleagues. Is Twitter the Best Social Media Marketing Platform?